The Shhhh cooking secretly challenge was on break for a few months.The group was revived this month and I am glad. I enjoy cooking with the secret ingredients given by a selected partner. So how does it work? Well every month you are paired with a fellow member. We give each other 2 ingredients to work with. No one else in the group knows the ingredients except the partners. If we are ready with the recipe before the 16th of the month, we post the picture on the group Facebook page. Other members begin guessing what the 2 ingredients are. Its really fun because we can be left scratching our heads or we may guess them easily. Usually it is difficult. The reveal date is 16th of every month. That’s when we post our recipes. Sometimes we miss the most obvious ingredient. Everyone comes up with innovative dishes right from juices to desserts. This month my partner was Niloufer of Kitchen Samraj and she gave me lemongrass and ginger as my two ingredients. I immediately knew what I wanted to make. These challenges help us to get through our bookmarked recipes. One such recipe was a lemongrass panna cotta. I made the panna cotta mixture but used agar agar instead of gelatin. Usually the panna cotta sets within 6-8 hours. However mine didn’t. Hubby was eyeing the dessert but had to tell him to keep his hands off it as it wasn’t set as yet. The ginger infused pineapple too was all ready stored in the fridge. The panna cotta didn’t set the next day too.I don’t know what went wrong. Is it because of the lemongrass? Was the agar agar old? I just don’t know. So now I had to think how I was going to tackle this problem. Ice cream came to my mind and voila got a delicious new dessert. A different sort of ice cream but it tastes very refreshing. 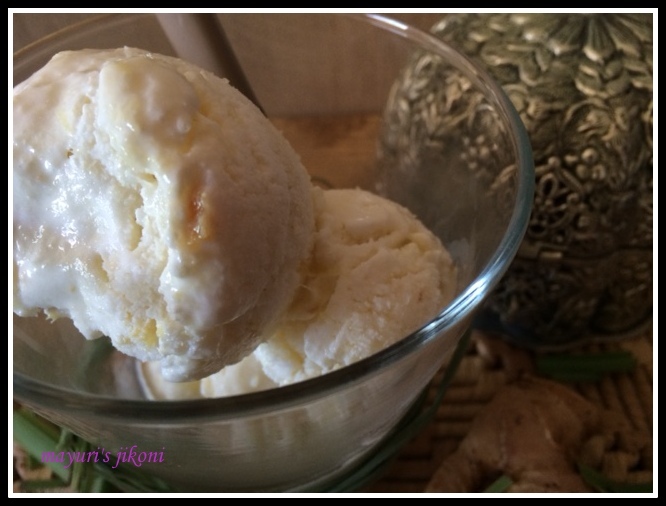 I pureed the ginger infused pineapple and added it to the ice cream. Hope you like this recipe.The title is pretty long, probably the longest one in my blog so far. If you want to join this exciting group please send us an email on any of the below emails with your name, blog name and facebook url. Cut lemongrass into small pieces. Add milk and lemongrass into a saucepan. Heat the milk till it comes to a boil. Cover the pan with a lid and let the lemongrass infuse into the milk till it cools down. In the meantime heat water in another pan. Add pineapple pieces and ginger. Let it boil over low heat till the pineapple becomes soft and the mixture is syrupy.Let the mixture cool. Strain the milk using a sieve. The milk will have the flavour of lemongrass. Add sugar and coconut cream and mix well. Put the mixture in the fridge to chill. Puree the pineapple mixture into a coarse pulp. Pour the chilled milk coconut mixture and coconut into the chilled ice cream bowl of the ice cream maker. Churn the ice cream for 15 minutes or as its written in the instruction booklet. Scoop out the ice cream into a container with a tight lid. Cover and put in the freezer for 1 hour before serving. You can mix the mixture and put it in a container. When it is semi set, fluff it up again with a beater.Put in the freezer. You can add any fruit of your choice. Make sure you grind the ginger into a fine paste. Let the ice cream sit at room temperature for 5-10 minutes to soften it . It will become easier to scoop it. 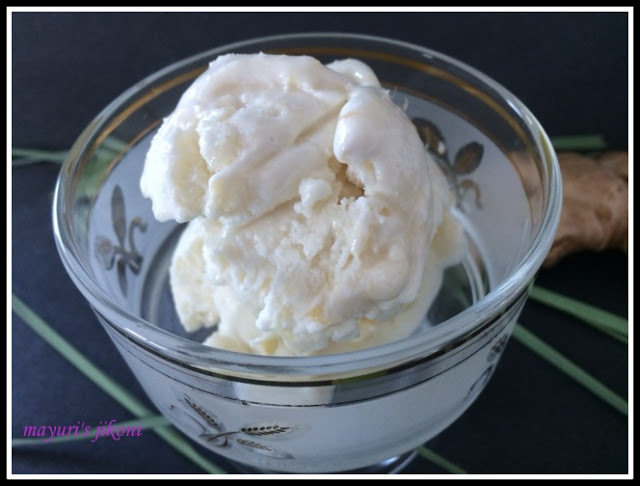 If you prefer a more creamer ice cream then use 1 cup milk and 3 cups of coconut cream. Lovely combination of flavors in the icecream. Looks delicious..
Lovely.. must be full of flavours too. I have never tried making ice cream at home. Truly a fabulous icecream, love all the ingredients went in it..I want to have few scoops rite now. 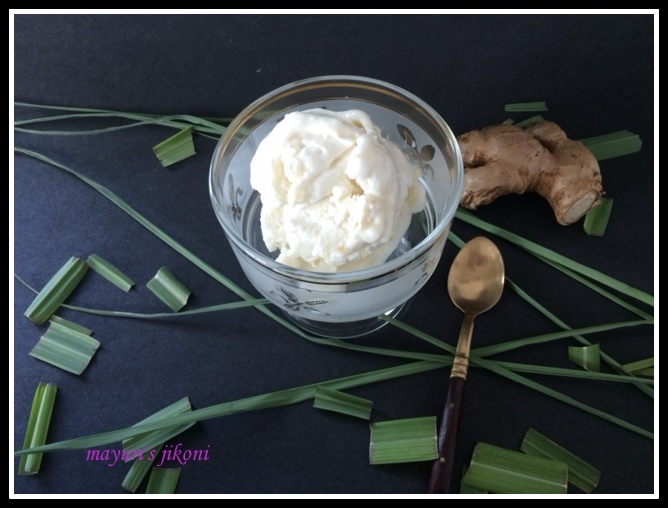 Lovely combo you used in icecream ginger with lemongrass something really interesting to me..yumm !! What a beautiful flavour combination – that sounds heavenly! Wow! Lemongrass in the icecream. How different and innovative. Sona, I loved the flavours. It was like every spoonful had a different taste. Thanks Shobha. I find it so easy. I was given the ice cream maker as a gift from my brothers and bhabhis. I make ice cream often because its quite hot in Mombasa. Thanks Priya, most welcome to come home and try it out. Rafeeda it tasted really good. I use lemongrass to make hot masala milk, masala tea, lemon juice and as a health drink with ginger. Thank you Jolly. The idea came about from the two ingredients my partner gave me to cook with in the SHHH cooking secretly challenge. You too can join if you want. Its fun. Thank you Sarah, the ice cream did taste great, hubby loved it. Thank you Donna. You too can join if you want to. Just let me know. It is fun and a great way to make new blogger friends.